A polarizing filter is a material, usually a special type of transparent crystal, which allows light waves of a specific polarization direction to pass through it . 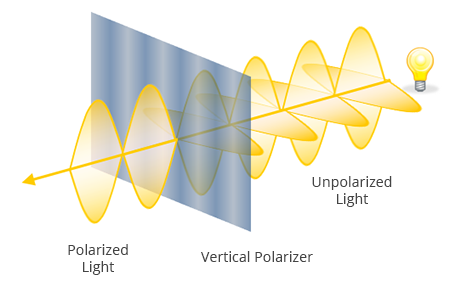 Figure 4 shows a vertical polarizer at work. Vertically polarized light waves pass through the filter unaffected, while horizontally polarized waves are completely blocked by it. What happens to a wave that is in between horizontal and vertical polarization? Such a wave can be thought of as being made of a vertical and a horizontal component, and only its vertical component passes through the filter. As a result, its strength is diminished. In the demo in Figure 5a, we have a polarizer P1 placed in front of a regular white light source. The light emitted by the source is unpolarized (includes waves of all polarizations). The light coming through the filter has been polarized and, in the process, it loses half its brightness . This is true regardless of how P1 is rotated. You can see this by using the slider to rotate P1. In Figure 5b, we have a second polarizer P2 placed in front of P1. Move the slider to the extreme left to align the polarization directions of both the filters. You see that P2 passes all the light from P1 through it. Now, if you slowly rotate P2 by moving the slider to the right, the light passing through P2 gets dimmer and dimmer, until it gets completely blocked when the polarity of P2 is perpendicular to that of P1. The use of two polarizers to control the brightness of light is the core principle behind LCDs. However, in an LCD, the brightness of each pixel needs to be independently controlled. Since a typical display has millions of pixels, it would be impractical to mechanically rotate polarizers within each one of the pixels. In the next section, we learn about a new type of material called a liquid crystal and how it helps overcome this problem. "Polarizer". Wikipedia. [Online] Available: http://en.wikipedia.org/wiki/Polarizer.